Love it or hate it, new expansion was announced today. My boss ordered Blizz Con and I went over to watch, some new stuff looks cool. The citadel part is kinda neat. You sort of get your own mini town to manage and minions to order about. Zathu wrote: Any still play this? If you pre-order the expansion digitally, you can get your free level 90 character immediately. Alpha just started, so the data leaks will start coming out frequently. WIP, and an alpha. But looks great! How does that typically work in MMOs? Is it just a limited number of houses available? 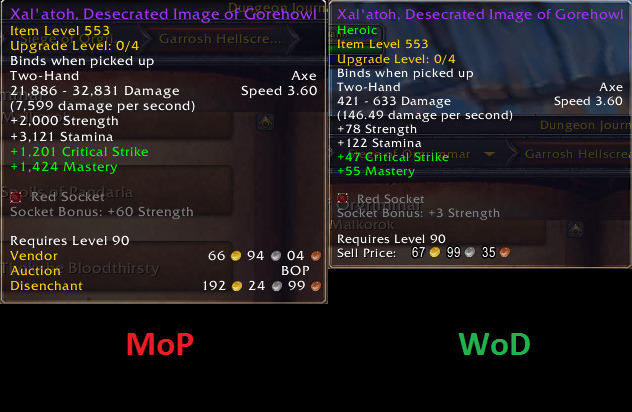 Zathu wrote: How does that typically work in MMOs? Is it just a limited number of houses available? Most games, you get an area. And you can choose from a few layouts. So, in WoW, you get an area you can customize with different buildings. The dark portals look awesome. Is it like a personal instance? Or is there a huge land of player housings? Zathu wrote: Is it like a personal instance? Or is there a huge land of player housings? They use a technique called 'phasing.' They use it heavily in quests now. So the same area will look different to each character based on your progression. But the area is still in the 'open world' and not through a portal. Everyone shares the same space of land, but it's private to you. Not a large area of land with everyone's houses, like in Star Wars Galaxies. No flying mounts will be allowed in the new expansion zones. Back to the original release philosophy, and only ground travel is allowed. I think it's a good thing. Kind of an inconvenience, but with flying mounts everything was too simple. Fly in, click item, fly away. Almost no fighting, almost no tactics. So I think it'll be a good idea. Also, Blizzard has said that the garrison will give you 'basically all 6 professions' if you chose. So, if you're not an enchanter, you can use the enchanting building to do almost everything the normal profession can do. I'm sure slower, or inefficient. But now you can do every profession. With the upcoming Warlords of Draenor pre-patch (6.0.2), we will be releasing sidelined characters’ names back into the wild. Any characters that have not logged into the game since November 13, 2008 will have their names freed up, making them available to anyone creating a new character or using the paid Character Name Change service. You will need to log in to World of Warcraft and enter the game using each character whose name you wish to retain before patch 6.0.2 goes live. While it is possible no one will claim your recently released name and you might be able to snag it again, it is probably not worth the risk if you want to keep your names intact long-term. Our goal with this great name liberation is to make sure new and returning players have a large and varied pool of names available to choose from—so log in now if you wish preserve your unused characters’ names for your journey intro Draenor. If you haven't logged in since 2008, I don't know why you'd care about your character name. BUUUUUUUUT, they're doing that.